Vibrational Essences of ceremonial plants used by indigenous peoples for healing and spiritual experiences. Ayahuasca Banisteriopsis cappi - Amazonian vine used in ceremonies like Peyote. This plant essence stimulates dialogue in the body for healing; assists understanding the body's messages. Use for immunological diseases, affirmations. Deepens telepathy between humans and others; develops clairvoyance, clairsentience. Please note this is a vibrational essence and not a herbal preparation. Flower essences are easy, harmless healing modalities that incorporate change on all levels of the body and psyche. They are part of a larger category of healing called vibrational medicine which includes homeopathy, gem elixirs and environmental, astrological and angelic elixirs. These vibrational remedies work primarily on levels of consciousness; new to Western civilization, they have been used for thousands of years by indigenous peoples of Australia and other continents. In their modern form they were developed in the 1930s by Dr. Edward Bach, an English homeopath searching for an effective healing mode that would cause no harm to the patient. Because these are vibrational remedies and not herbal preparations or essential oils, a laboratory analysis would reveal no physical presence of the plants themselves. Rather, similar to homeopathic remedies, their energies exist only on vibrational levels, which modern science has developed very few techniques for measuring. Hummingbird Remedies are a labor of love. They were made with intention and impeccability in the Pacific Northwest, North America, Mexico and Hawaii, from plants growing in wilderness areas, botanical gardens, nature sanctuaries, and co-created private gardens, in conscious communion with overlighting angelic and devic forces. Our gem elixirs are prepared from stones in private collections. These remedies offer tremendous potential for transformation and healing on many levels, and many new essences are presented in this catalog. These flowers all called out and asked to be added to the vibrational repertory. Many of the remedies are made using a "no-pick" method, leaving the plant unharmed. Devic forces biomagnetically imprint the pure water with the plant's energies; the essence is then further stabilized and amplified when required. Gem elixirs are made using the traditional method of a sunlight infusion into pure spring water. After energetic stabilization and preservation with 50% brandy, each remedy is entered into the repertory of selected practitioners and tested for appropriate uses. I also do a channeled session for each, wherein I'm given specific information regarding origin, history, uses and definitions, test points, etc. This is shared with practitioners to assist in selection and use among their clients. A much-edited version becomes the catalog definition, and we are working on a manuscript of all channeled information about all the essences in the Hummingbird repertory. Flower essence selection is not an exact science. There is a fair amount of leeway on choice of remedies; although there may be one perfect remedy for your needs, there may also be many others that will also work very well. One of the best things about flower essences is that there are no bad choices; if you take the wrong remedy, usually the worst that happens is nothing happens! You can read the definitions and let your conscious mind/left brain/intellect decide. Some people choose their essences by affinity, or difficulty; they know a plant and already love it, and when they find its uses correspond with their needs, they feel the match was made in heaven. Others find they've always had a problem appreciating a certain plant, and then find its definition describes their need exactly. Some use radiesthesia (dowsing) or kinesiology (muscle testing) to choose a remedy. If this is something new to you, consider finding someone to teach you these skills. This method works well if you don't want to commit all remedy definitions to memory, or you don't trust your conscious mind to give you honest answers regarding unconscious issues. A number of people exhibit extra-sensitivity to the remedies in various ways; some pass their hands over a collection of bottles and respond to one or a few with tingling or other sensation that indicates an affinity; others hold them in their hands to "feel" if it's right. Some people can hear the description or occasionally just the name, and they intuitively "know" it's the right one. In general, it's not how much you take of a remedy, but how often. Thus, a remedy taken twice a day, 7 drops each, may have less impact than when taken 4-6 times a day, 2-3 drops each. To find optimum dosage, radiesthesia or kinesiology techniques may be ideal; but in general, most remedies are taken 4-7 drops at a time, 4-6 times a day, until relief of the condition is experienced. In cases of extreme need, remedies could be taken as often as 5-15 minutes apart, until some shifting is noted; at which time frequency of dosage could be lessened. Paying attention to one's inner and outer states and symptoms can be a useful guide to whether and how long the remedies could be taken. All Hummingbird Remedies are sold at stock concentrate, and are created to last many years with proper care. They can be used full strength, which is often appropriate for physical issues, or they can be diluted in a ratio of 4-7 drops stock to one ounce of pure water. (You can preserve these dosage bottles with 20-50% brandy or vinegar to keep indefinitely; or 10-25% glycerin will protect the dosage bottle for up to three weeks—less, in warm weather.) Another suggested use, and easy, is to put 7-12 drops of stock essence in a quart of pure water, and sip from it throughout the day; this works well with tonic-type remedies. When using remedies for specific times and situations, such as group work or spiritual practices, we suggest taking the remedy a few minutes before you begin. It is suggested to store your essences out of direct sunlight, and away from temperatures above 105° F. Because these are vibrational remedies, there is a chance that strong electromagnetic fields may weaken the potency. Therefore we highly recommend that you keep these essences eight feet or more away from computer terminals and TV's; six feet from major electrical appliances; and four feet from fluorescent lights and digital alarm clocks. 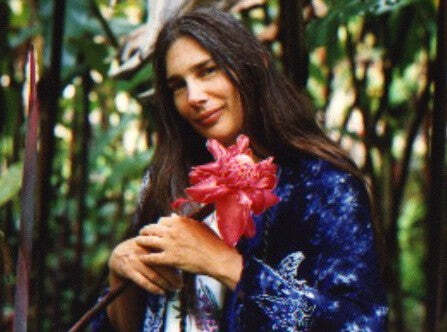 My psychic connection with plants began in adolescence, nurtured through years of training as an organic master flower gardener, nature guide and amateur botanist. I began working with "new" remedies in 1987, and have been producing my own essences since 1991. After 15 years in Oregon learning the Cascadia bioregion, I moved to Maui for two years in 1995 to continue this work, focusing specifically on tropical flowers brought to Hawaii from around the world as specimens for a botanical Eden. In 1997 I was asked to begin producing gem elixirs, some of which are included in this repertory. I see my job as co-creating new remedies for the healing and transformation of sentient beings, for the purpose of accelerating our evolution into Light. Without support, encouragement and guidance from inner realms and other colleagues, this work would be impossible. In my work and in that of other practitioners, we have seen outstanding results and significant progress when the right remedies were given. Yet, it is difficult to track physical effects of a vibrational remedy, as one disease may have many different karmic causes. Therefore, for use in the physical realm, please consider these definitions as suggestions for further exploration. As always when using experimental and alternative treatments, it is recommended you work with a trusted healer regarding any pre-existing conditions. May these remedies serve and transform you, and may you remain in Light.